For more than 1 day per week contact us for registration. *For MONDAY classes please contact us to register. Due to holidays there are only 8 weeks in Spring Monday Preschool Prep. The rapid, intellectual growth in the first four years of life is nothing short of miraculous! The experiences children are provided play an important role in the hard-wiring of their brains. The "Window" for language acquisition is during this time. All language goes into a single file and perfect accent can be acquired and stored. 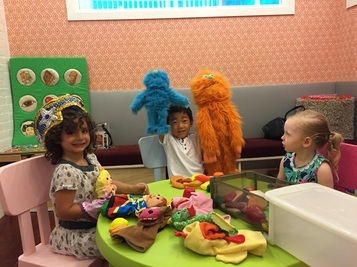 Our 2-hour Bilingual Preschool Prep classes help to prepare children for New York's top preschools and kindergartens by providing an array of bilingual activities that stimulate learning through exploration, discovery, creation and play. Each session is split into two 50 minute segments with a nut-free snack break in between. Classes are conducted in a gradual immersion environment that allows children to comprehend and speak in the target language unlike any other program. The curriculum is designed to stimulate the 5 major skill areas: social, emotional, language, motor and cognitive combining traditional preschool prep curriculum with Maurice Hazan's groundbreaking QTalk Method of Language Instruction. Choose 1-4 day per week participation. prorating available. Ask about trial classes. Let us know you are looking for and which day(s) are best for your schedule. We frequently match students up and add classes to the schedule per demand. ​Parents and caregivers love our convenient location at 22 Harrison Street in Tribeca. For the children, it's like playtime! Our QTalk vocabulary tools are just like toys or game pieces for educational play. Toddlers have so much fun, they don't even realize how much they are learning!